Rice is the staple food for over half of the world’s population. It’s probably the most important grain in terms of the nutrition it provides the human race. But it also makes a darn good snack, and that’s important too! Here are some of my favorites. There are so many varieties, so many flavors, shapes, and textures. 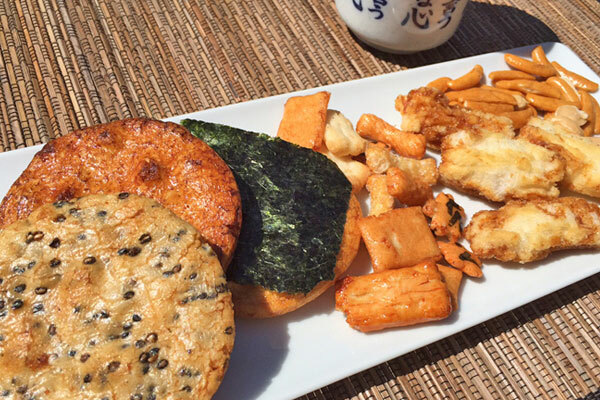 The round disk kind are the classic senbei and gives me the kind of crunch I like the best. Sometimes you have to have good teeth though, because these guys can get pretty hard. It’s my addiction to soy sauce that gets satisfied when I bite into one of these. Senbei is basically grilled, baked or fried rice cakes that have been flavored with soy sauce or any number of ingredients. The nori wrapped ones are also popular; I love how the nori gives it an added dimension and a “leave behind” texture as you chew the sheet of seaweed. The smaller bits are known as arare, which comes from the Japanese word for hailstones. These make pretty good beer chasers, although I don’t think they’ll ever replace peanuts. Hawaiian locals discovered how to mix them with popcorn and call it “Hurricane Popcorn”. I like the ones called Kaki no Tane, which means persimmon seeds because of the resemblance. They’re usually spicy and mixed with peanuts. The lightly colored ones are made from a different (glutinous) kind of rice, which gives it a softer crunch; not a crack! but more of a scrunch! I love these for variety–they’re usually salted vs. coated with soy sauce. From hard and crispy and savory to soft and sticky and sweet! 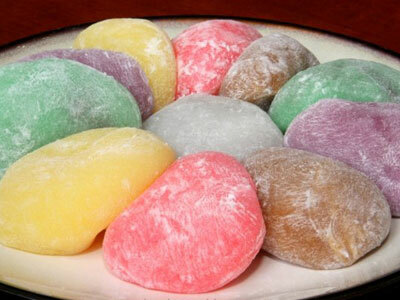 Japanese mochi is so good, you can fill it with anything from adzuki red bean paste (traditional) to ice cream. They come in all kinds of shapes, and the fancy ones can get pretty pricey. Despite all the modern styles though, mochi is still one of the traditional Japanese desserts that has been been around for centuries. It’s still one of the best companions to green tea ever, IMHO. 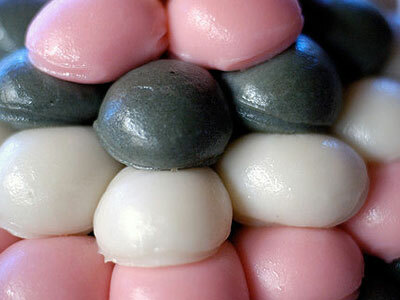 Koreans also like their mochi, but theirs (called duk) is a bit firmer and less sweet. You can buy the kind filled with a brown sugar syrup at the Korean markets, often coated with a sesame oil to keep them from sticking together. Japanese dust theirs with flour to serve the same purpose. Also known as Pak Tong Koh, this is my go-to dessert when I’m having Dim Sum. 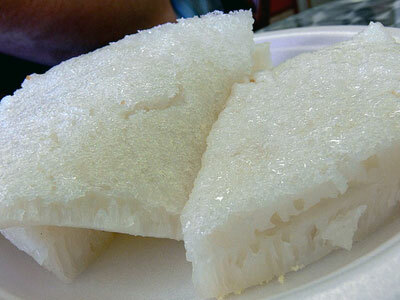 Usually diamond-shaped or triangular, the light sweetness is perfect after several rounds of steamy dim sum. It reminds me of mochi, but not quite. It’s more gelatinous and translucent, as if I’m eating rice pudding in solid form. I usually eat one piece at the restaurant and bring the rest home. We can’t talk about rice snacks without mentioning this all-time, All-American snack, can we? 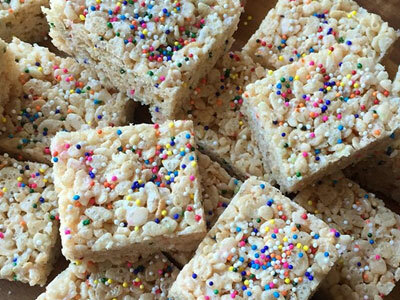 These simple marshmallow infused, crisped rice treats will never grow old. Why? Because adults don’t want to grow old, and when we see our kids scarfing these treats, we want to feel like them! Rumor has it that when working on the original recipe, molasses was used; but it was soon discovered that marshmallows were less messy. Brilliant move! 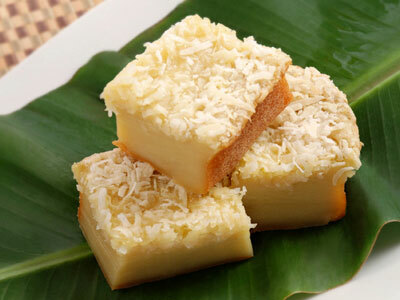 For all you malahinis out there, if you don’t know what Butter Mochi is, it’s exactly what it sounds like. The base is mochiko, sweet rice flour, and with the addition of butter and sugar, you’re basically making baked custard. It’s a bit dense, because it is mochi after all, but the semi-chewy texture and richness of flavor is so ono! Zojirushi has their own version that you can find here. Gelato di riso, or Rice Gelato. The perfect blend of a not too sweet rice pudding that’s icy cold! 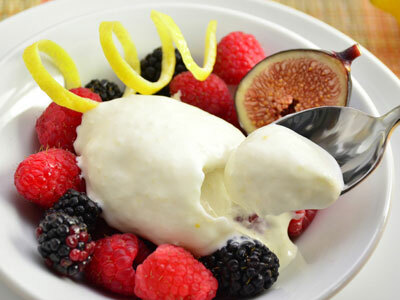 This is good stuff indeed; this dessert still gives you the creaminess of ice cream, but adds that extra dimension of texture with the bits of rice. Go Italy! go Gelato! Delizioso! I found a nice recipe on the Zojirushi site here. 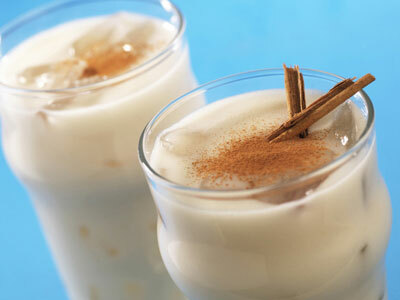 The Mexican version of this dessert drink is made with sweetened rice and cinnamon. In various Latin American countries, they use ground seeds or nuts instead, and there are alcoholic versions as well, made with fermented corn flour. My daughter loves the horchata that we can get at the local Mexican restaurants near where we live. And it’s a great alternative for the lactose intolerant too! So after compiling all these rice snacks that I’m personally fond of, I got to thinking that I just traveled around the world just on rice! I went to Japan, Korea, China, Hawaii, Italy and Mexico! No wonder rice feeds over half the world’s population! One of the best things about going to a café is the richness of the experience. 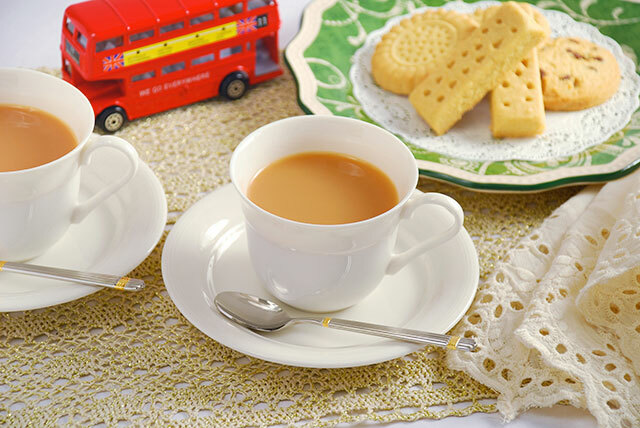 We go because a barista is able to craft the most flavorful cup of coffee and steep the perfect pot of tea, serve it in lovely cups, usually with a small biscotti or tea cake. We go because the indulgence reminds us to take a break, calm our minds and refresh our bodies. That same luxurious experience happens at home or at work, when our beverage is made with care and attention. Brewing a delicious cup of tea, especially, requires high-quality leaves, water heated to the correct temperature, and the right amount of steeping time. When brewed carefully, tea doesn’t lose its unique flavor, potency and aroma—after all, who likes a harsh, acidic and bitter cup of tea? Zojirushi has developed a new water boiler, the Panorama Window® Micom Water Boiler & Warmer (CD-LFC30/40/50), with features that truly help people create beverages of the highest quality, with the richest experience. 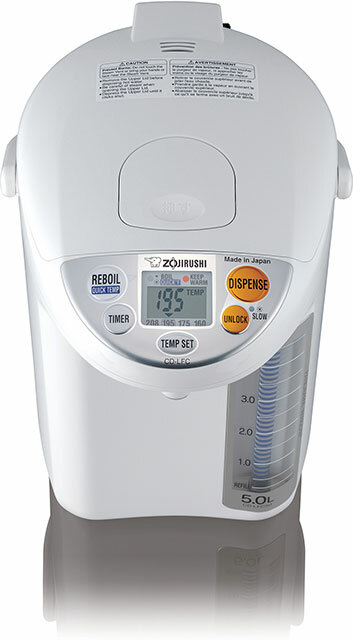 The Panorama Window® Micom Water Boiler & Warmer is an energy-saving, compact appliance with a swivel base, a large panorama window on the water gauge, four KEEP WARM temperature settings, REBOIL and optional QUICK TEMP mode, a timer function, café drip dispensing mode, and multiple safety features. One of the highlights of the Panorama Window® Micom Water Boiler & Warmer is the optional QUICK TEMP mode. With the regular mode, heating water to 175°F would require it to first be boiled, and then cooled to reach the selected temperature, taking a little over two hours. With the QUICK TEMP mode, a full boiler of water can be heated to this temperature in 20-30 minutes, depending on the size of your water boiler and the temperature setting. No boiling means considerable time savings! The four temperature settings—160°F, 175°F, 195°F and 208°F—are ideal for brewingcertain types of teas and coffees, and making instant foods and baby formula. For example, you can use the 208°F setting to brew black, herbal, pu-erh, mate and rooibos teas, as well as prepare pour-over coffee and instant noodles. 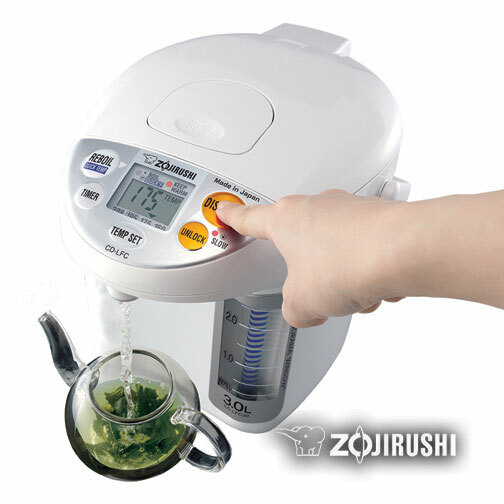 At the lowest temperature setting of 160°F, you can steep delicate green teas such as gyokuro without burning them, and even warm up baby formula. The Panorama Window® Micom Water Boiler & Warmer is available in a 3.0L, 4.0L and 5.0L capacity. Find out more about it and take a tour of the product through our latest video. Autumn is here and it is time for the glorious taste of matsutake mushrooms! This vibrant mushroom, also called the “pine mushroom”, is traditionally gathered in September in forests where undisturbed red pines grow in Japan, Korea and the Pacific Northwest. It’s a rare and wonderful fungus, whose flavor is so prized it is used as a main ingredient in Japanese dishes. 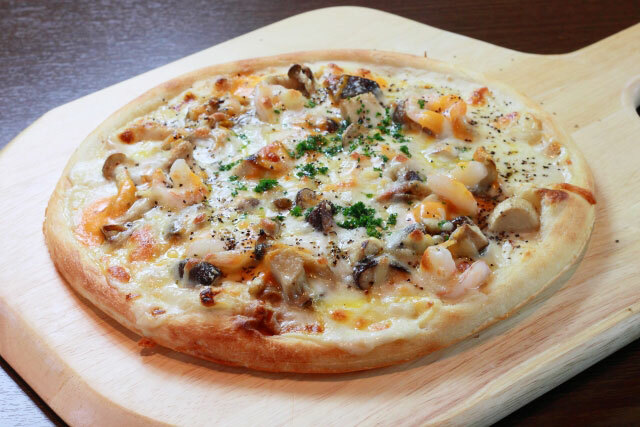 How about a matsutake pizza? The matsutake has a meaty stem, with a light brown cap when fully grown. Prized, tender, young matsutake are paler and smaller in size and are found in the duff at the base of red pine trees, forming subtle bumps called ‘mushrumps’. Because the mushrooms are picked wild and usually eaten before the cap spreads open, devoted gatherers wipe them clean with a damp cloth, trim them closely so as to retain the most woody, aromatic flavor possible, and celebrate their bounty by cooking them in the open air, grilled or delicately sautéed. Two fabulous traditional recipes are Matsutake Gohan, a seasoned rice dish made with wild matsutake, shoyu, mirin, sake and mitsuba, as well as Matsutake Dobin Mushi, a soup made with matsutake, gingko nuts, mitsuba, thin slices of chicken, shrimp and dashi broth, all steamed together in a small teapot. Because of its short harvest season, cooking with matsutake can be expensive. 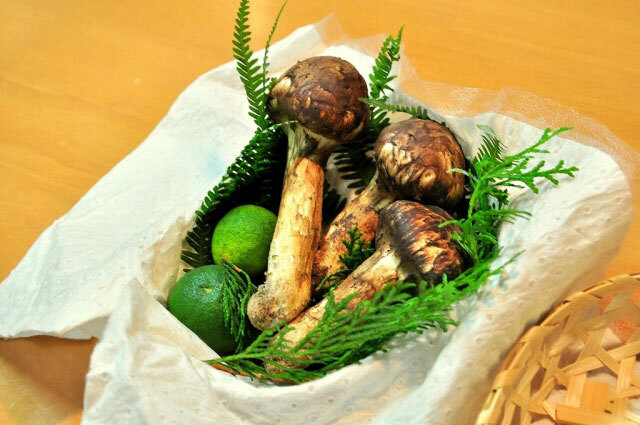 Last autumn, wild-harvested Japanese matsutake sold for approximately $500 per pound. Prices are significantly lower for US-grown matsutake, but these mushrooms are still considered the most expensive in the world, even beating out wild-harvested French truffles. In the US, fresh matsutake can be found at Japanese and other Asian grocery markets and gourmet food stores, or can be ordered online from various specialty retailers. When shopping for matsutake, it’s best to purchase fresh ones, as the mushrooms are by tradition not dried. Canned matsutake have become available, although they remain a poor substitute for the truly delicious newly-harvested ones. Have you tasted this wonderful delicacy? Tell us about your favorite matsutake experience! Japanese cooking relies on a few carefully selected implements…a good knife, long chef’s chopsticks, a rice cooker and a mortar and pestle, or the suribachi and surikogi. The suribachi is a finely-crafted earthenware mortar, in which all kinds of foods, seeds, spices and herbs are ground. Glazed on the outside in either a traditional brown or more modern hues, the medium-to-large sized bowls are carefully designed on the inside with rough ridges, called kushi-no-me, against which the cook will grind food. As with many Japanese arts, these fine ridges are often created to be beautiful as well as functional, and can be found in circular, comma or daisy-wheel patterns. 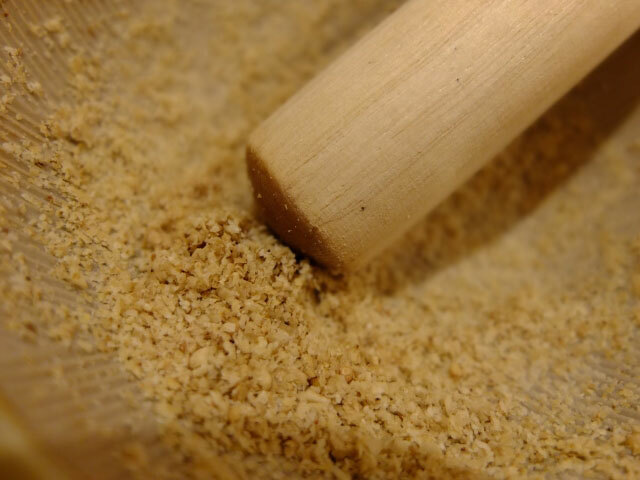 When used with a surikogi, or wooden pestle, the textured interior surface helps to mash food quickly, until it is pulverized to the desired consistency. The surikogi adds much to food preparation. Traditionally, the surikogi is made from the thicker part of the trunk of a sansho bush (Japanese pepper tree). 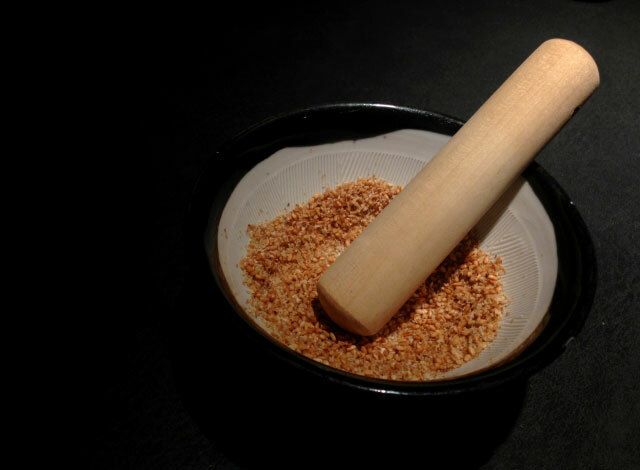 When the knobby bark is left on the pestle, it helps cooks hold onto the implement more easily, and also imparts a slight and subtle peppery flavor to the food in the mortar. The suribachi is originally from China and was introduced to Japan sometime in the 11th century. The earliest ones were made from rough stone and used to make medicine, grind flour, and roughly work other food. In modern Japanese kitchens, the suribachi and surikogi are much more refined, and usually purchased as a set. Japanese cooks will tell you to buy a big suribachi so that seeds don’t come flying out, and a sturdy, thick surikogi, so that it stands up to the demands of crushing and grinding. When using the suribachi, it’s important to place it on a flat surface, on top of a silicone mat or folded towel, for stability. And the best technique for using the surikogi is to hold it with two hands, one at the top of the dowel and one at the bottom, and rotate around the mortar. For many gourmet cooks, implements like the suribachi and surikogi can be used to make dishes from multiple cuisines…Japanese shiraae dishes, Middle Eastern hummus and muhamara, Indian garam masala, and even Moroccan harissa! No matter what style of food you enjoy, the Japanese suribachi and surikogi are drool-worthy kitchen wonders. Tell us what you use yours for! When people first learn about bonsai, they are often surprised that it is considered a form of art, rather than gardening. Bonsai, for many, is an object, a tiny potted tree, one that is cared for just like any other potted plant. But true bonsai is an activity, one that is undertaken for many years, with patience, sensitivity and nurturing. 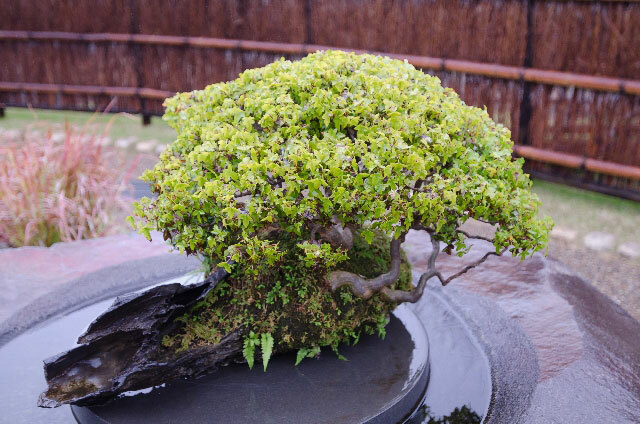 Bonsai trees are not stunted or pruned into an artificial shape. Just as a painter works on a canvas or a sculptor works with bronze, bonsai artists work with the living structure of a tree, cultivating and coaxing it into its final beautiful form. Bonsai artists respect the dignity of each living organism, working with it over the years to help focus its growth and character. Depending on the artist’s vision, the trees can grow to be a few feet tall or be shaped into the tiniest miniatures, and be cultivated into balanced, natural, shapes. The most popular varieties of trees and shrubs used in bonsai are pines, whose leaves are evergreen, maples, whose leaves change color in autumn, flowering cherry or plum trees, and fruit-bearing trees, like the quince and persimmon. Regardless of the tree chosen, a beautiful and well-suited container is always considered part of the entire piece. Bonsai cultivation has a large global following. 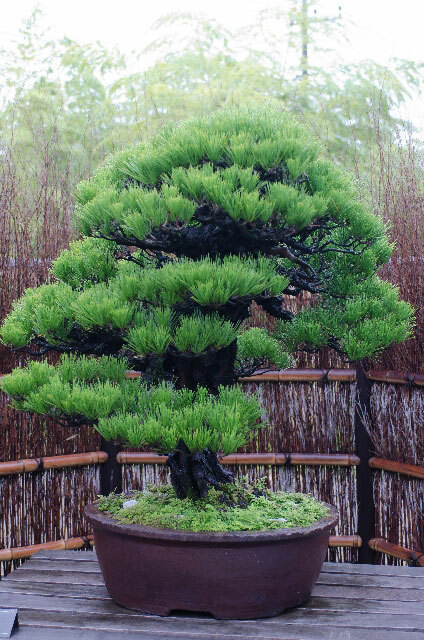 While originally a Japanese art, the World Bonsai Friendship Federation has done much to promote the exchange of ideas, designs and culture across the globe. Every few years, they host a World Bonsai Convention, with the next one to be held in April 2017 in Japan, at the traditional birthplace of bonsai, in Saitama City at the Omiya Bonsai Village. Bonsai has an interesting history. It was originally a hobby for aristocrats and priests during the 14th century. As bonsai art spread into mainstream Japanese culture, more people began creating these small trees, and, in the early 19th century, when Japan opened its doors to the world, many visitors from Western countries began growing bonsai. After World War II, the art of bonsai spread even more, as large-scale exhibits were staged and the trees were given as gifts between nations. In modern times, creating bonsai doesn’t require a visit to Japan. There are many resources for growing your own tree from seeds, learning how to develop the best environment for the plant with the proper mesh screens, how to reveal the trees’ most beautiful shape through pruning and wiring, and how to enhance its growth through watering, feeding and fertilizing. 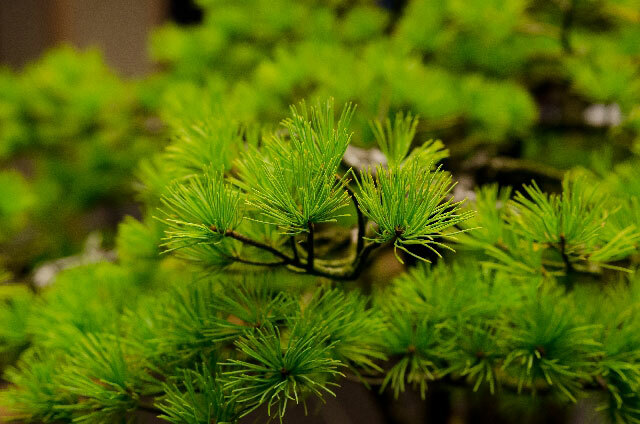 Bonsai clubs are a great place to start! Do you have a bonsai that you love? Are you part of its creation, or was it handed down to you, generation to generation?